Meet Emmy. 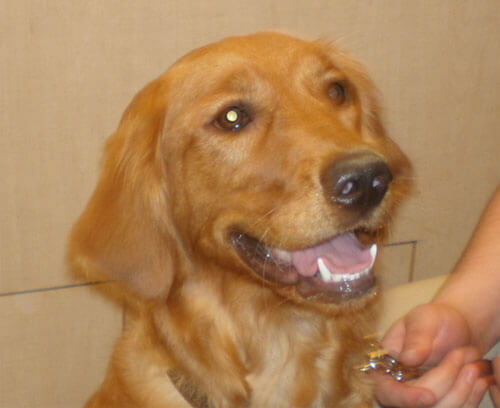 Emmy is a rambunctious 8 month old Golden Retriever puppy who presented to us recently for acute vomiting. She had vomited up a sweat band and some other material earlier in the day but still could not eat or drink anything without vomiting. Upon examination, there was a palpable swelling in her abdomen consistent with an intestinal foreign body. Initial x-rays did not show any evidence of an obstruction, but when Emmy was not improving with conservative therapy a follow up exam and abdominal x-rays revealed an intestinal foreign body. Surgery was scheduled and an athletic wrist band was removed from her intestine. Unfortunately, the obstruction had already damaged a portion of her small intestine which had to be removed surgically. Emmy made a full recovery and because of her bravery has been named Pet of the Month for June. Way to go Emmy!